Views from the loch. : Rubbish! Photo 01 - Kindly left for us to pick up! 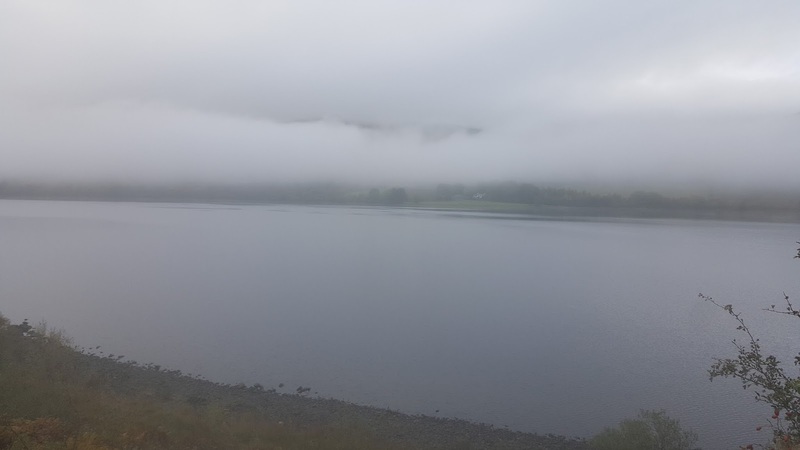 The majority of our visiting anglers are right thinking individuals out to enjoy a spot of fishing, the ambience of the lochs and leave the area as they found it! 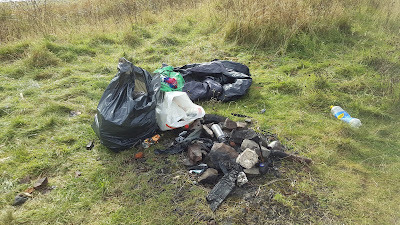 How depressing then to find the above photographed pile of rubbish clearly left by people masquerading under the banner of angling. The now usual find of pre packed bait was again evident. Yes these are not real anglers for real anglers leave no footprint of their stay. This lot loosely gather up their rubbish and then leave it for someone else to pick up after invariably being scattered all over by the wind. You really do wonder about the understanding of these types, most anglers I know would be highly embarrassed to leave such a mess yet this type seem to have no qualms whatsoever about leaving a monumental mess! The amount of empty beer and wine bottles left was absolutely jaw dropping! Unfortunately we cannot be 100% sure as to who left this rubbish but it looks like being down to a group from Hawick. Of course if this is the case then it is even worse as we like to think as Borderers we have more sense and respect for the countryside but maybe we are kidding ourselves! We will try and home in on the offenders and if we catch them we will hand our information to the police. It goes without saying that these people will be barred from fishing on the lochs! On the subject of trash I have lost count of the number of enquirers phoning about the fishing who also felt compelled to comment on the ill thought out and embarrassing antics of our ex loch keeper Mr Xxxxx. Almost invariably they are condemning of his childish behaviour and make derogatory comments regarding his intellect! I don’t think it was his aim but he has now become the most reviled man in the history of St Mary’s Angling Club! The theme of the comments seems to be how could a man who claims to be a rational human being behave in such a shameful and hateful manner! How an individual could be so bereft of knowledge issue a “letter” to members comprising purely of hate inspired lies and conjecture and hope to convince others! My answer is that I have no idea and since he seems to have disappeared we will probably never find out! His aim which now is laughable following our expose was to unseat the committee and stage a takeover of the club which is a viable aim but his implementation of that plan was more what you would expect from an imbecile rather than from a rational being! Yes he took counsel from three people ousted by the club a long time ago namely the angling bully and the two moaning minnies of the village! They used him to their own ends and he fell for it like a lamb to the slaughter! Photo 02 - The mist lifting yesterday! The 19th of this month was the cut off date for entries and no one submitted a heavier Pike than Scott Redpaths 21lbs 9oz specimen. Therefore he is the winner of the heavy Pike cup and the £20.00 for the 2016 season so well done Scott we will be in contact soon to arrange your presentation. It just keeps getting worse Theresa May has completely lost control of her party with hardliners spouting forth at every opportunity. Prices are now shooting upwards with petrol climbing at a ferocious rate which will of course impact on everything! The possible figures for the unemployment that may ensue are truly terrifying and a recession looks to be very much on the cards! Several banks are on the verge of pulling out of the UK whilst some large companies are poised to jump if a hard Brexit becomes the outcome. It also looks likely that the end process for the United Kingdom has already begun! Tomorrow then is a very important day as the leaders of Scotland, Wales and Northern Ireland meet with already beleaguered PM Theresa May to demand equality of views in the upcoming negotiations. Nicola Sturgeon will rightly demand that whatever the UK decides Scotland must remain in the single market! She must be resolute and stand her ground for if she fails we will suffer the same fate as England. Lord Snooty who has now been voted as the second worst PM behind Butcher Thatcher started this crisis which is clearly unwelcome at this time when all our beloved institutions such as the NHS, public and social services and numerous others are on the point of collapse! The Tories in government are near imploding point, Labour is fragmented and directionless and the Puppets wiped out. None of the above gives hope for the future and we as a Scottish nation must ditch them all and secure our own independent future! It is clear then that the way to secure the very best for the people of Scotland is to take independence! The question now being asked is does the Scottish government have the required authority to hold a second referendum. Although Theresa May is correct in saying that they do not and the UK government solely holds the right to grant such power. The salient point of course is, if it is the will of the Scottish people such a request could not be denied! Expect much bluster but Sturgeon will prevail we can only hope it will be sooner rather than later! The club Annual General Meeting!